How Do Hair and Fiber Differ? NGSS Life Science DCI LS1. In this lab activity, students will learn how to determine the species of origin from a hair sample, differentiate between natural and synthetic fibers, and perform tests to identify the specific type of fiber. Students will use their observational skills and a compound microscope to examine the morphological characteristics of hair and fiber. This lab activity employed Framework Science Standard LS1 (Matter and Its Interactions). This kit has been aligned with all published National Standards. Pre- and Post-laboratory assessments and vocabulary words all target specific Science and Engineering Practices and common core standards. The teacher guide also contains specific "Did You Know" concepts that link the real world with scientific standards explored. A student copymaster is also included. 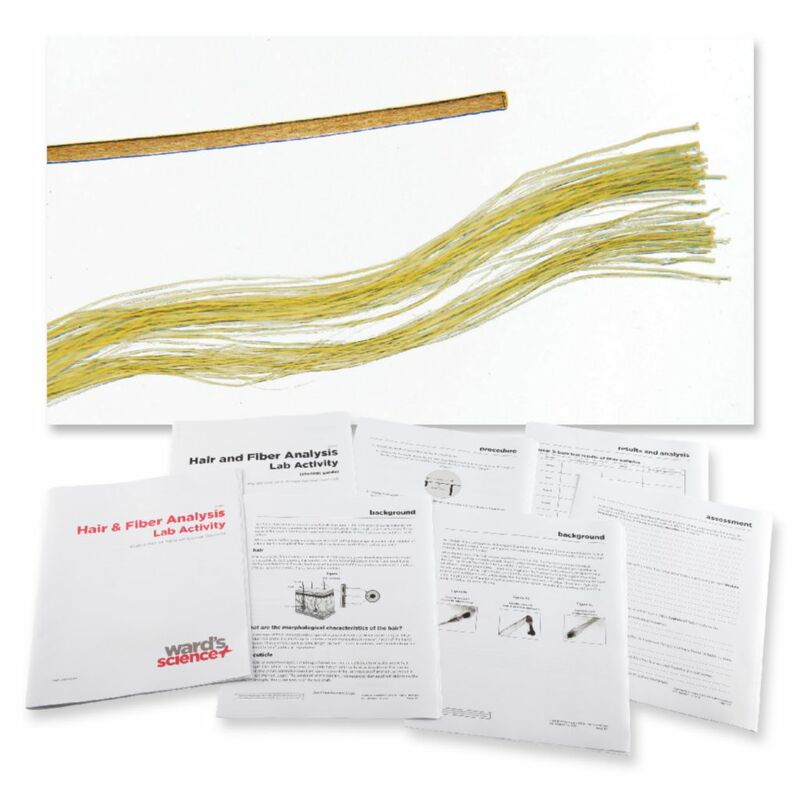 This kit includes enough materials for 12 student setups. Ordering information: Activity includes Microscope Slides, Coverslips, Human hair sample sets, Animal hair sample sets, Fiber sample sets, Forceps, and Nail Polish. Materials needed but not provided are Compound Microscope, Additional fiber samples, Forcibly removed hairs, Naturally shed hairs, Fume hood or well-ventilated area, Aluminum foil, Permanent marker, Ocular and stage micrometer, and Metric ruler. This activity takes approximately two to three 45 minute lab sessions to complete.